I think there is a special place in heaven for Kinder teachers. I once saw a sign at a craft show that said "Teaching kindergarten is like trying to herd grasshoppers". I would be lying if I said that I didn't have a little panic attack right before each of my 6 kinder classes come into the library every week. I see them once a week for 30 minutes which includes story time and checkout. I hate to admit this but when I first became a librarian, 5 minutes before my first kinder class came for the week, I would look quickly around the library and chose a book at random to read to them. There was no rhyme or reason to what I picked. It was just something to get me through those 15 minutes. I am happy to say that I no longer do that. Thanks to one of the other librarians in my district that I was mentoring one year (however I think I actually got more from her than she got from me). She was new to our district but had been a librarian way longer than I had. She showed me the journals that she does with some of her grade levels and something clicked for me. I could do this with Kinder! Each one of my kinder students has "My Library ABC Journal". It is a journal from A to Z with a book and activity for each letter. It stays in the library all year long. Each week we do a letter in the journal and at the end of the year they get to take it home to remember all the great books we read that year. They really enjoy seeing how at the beginning of the year their "writing" is mostly pictures and maybe the beginning sound of a word but by the end of the year they are writing sentences. It is fun to see their excitement each week as they try to guess what letter we are going to do that week. And I feel better knowing that I have a focus for my lessons using our state standards and really great books. What are things you do with kinder in the library? Do you choose your books based on the topic that is on the ABC page? 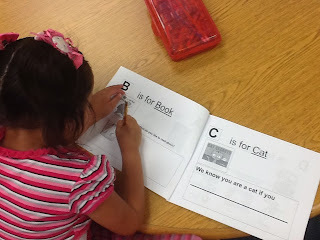 Like, maybe Pete the Cat for C is cat? Or is P for Pete the Cat? I love this idea! @ Mrs. Alli - yes, I match the book to the letters but usually it is more choosing the books first and then deciding which letter I can make work. Some start with the title like the B book was called "The Wonderful Book" other times it might be something within the book or like this year I did I for Illustrator and we used the wordless book "Chalk". I always put the cover of the book on the page so they can go back and remember the title.